I'm currently really loving these things- they are bringing me lots of inspiration today! 1. Ben Moore (and also Sherwin Williams) fan decks. I'm working on my final project for school and these babies have been getting some use. They are worth their weight in gold right now, I don't know what I would do without them! 2. LOVE the color of these Kendra Scott earrings. So perfect for the upcoming holiday season. 3. Ok so this painting has the most beautiful colors- but I am a horrible blogger and I have no idea who its by- please help so I can give credit! 4. I had this glitter nailpolish on this past weekend for my birthday celebration and I loved it. Its like a party on your nails! 5. The current issue of House of Fifty is ahhhh-mahhh-zing. So many ideas, so much inspiration, Janell is awesome! 6. How cute is this hook? It would be such an unexpected wall hook for your winter coats. 7. I really think this Harry Allen piggy would be a great reminder to my inner shopping freak that I need to SAVE more. The gold one is my favorite of course. Of course the $125 price tag for him would be going against the whole "save" message. 8. More glitter! This holiday season I want to glitter EVERYTHING I can get my hands on. I probably wont since just a little glitter does the trick, but I still love all these colors. Lindsey - Where did you get your fan decks. I've always wanted a BM fan deck, but haven't come across one. so funny- I just posted one of my favorite things at Meet Me in Philadelphia, and then more faves on my own blog, including the pig! To people have gifted it to me (I only kept one), so i guess it's really "me"! Emily you can usually get them at any store that carries Benjamin Moore, and they also sell them on their website, they are $25 each I believe. What a great round-up! I have been meaning to try something fun on my nails for a while, this sparkle polish might just be the thing i've been looking for! Emily - I would go to the store. If you are a designer the B.M. store should give you a discount. I got mine for $17.00. Those earrings are fabulous! I need some sparkley bling for the holidays, might be adding those to my shopping list! i want a pair of kendra scott earrings! comes in so many colors, i just can't decide! GREAT picks! i have those kendra scott danielle earrings in 4 colors, and i just picked up the martha stewart glitter kit (on sale!) - the possibilities are overwhelming! From the looks of it, you are VERY ready for the holiday season to officially begin. Loving the sparkle and glitter throughout this roundup! I own the earrings and love them!! Those earrings are divine...and I am so honored you included our Holiday issue of House of Fifty in your collection! Seriously, does it get any better than that golden pig? I don't think so. 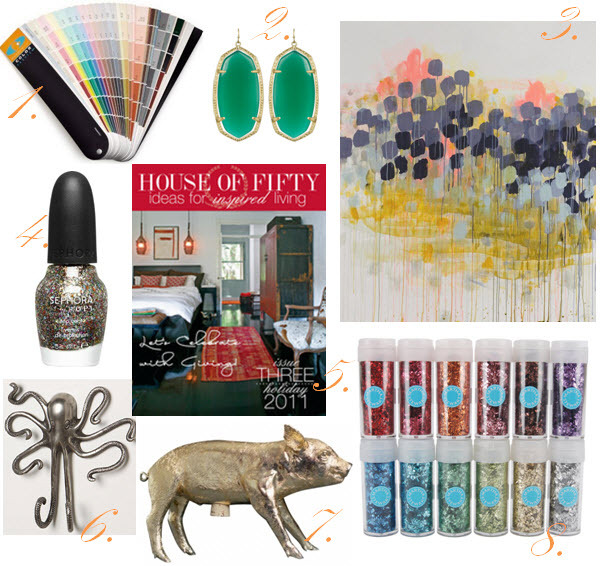 Thanks for including House of Fifty in the mix! Hell yes to gorgeous abstract art, glitter nail polish and golden swine. Really, what more do you need in life?! Great selection. I`ve always loved that octopus hook, keep waiting for it to go on sale!! Oh, this is getting me in the mood for the holidays and putting together my own wish list! Love all the color and sparkle! Loving the gold pig, so cute! Loving the earrings! Perfect shade of green! I want the little piggy really badly! I love the painting too! that purpley/grey and the yellow together... so beautiful!